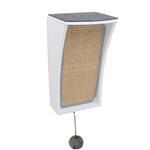 The Primetime Petz Hauspanther CATchall Wall Mounted Cat Scratcher is space saving, stylish, and multi-functional! The Primetime Petz Hauspanther CATchall Wall Mounted Cat Scratcher provides cats a place to scratch, perch, relax, and play! 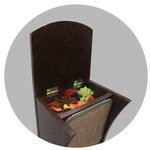 Its hidden storage space under the perch gives you a place to store any small cat toys or necessities. 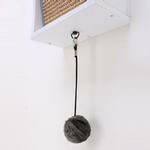 The replaceable sisal scratching surface fulfills cats scratching instincts and helps groom and maintain nail health. It features a detachable toy that cats will love to play with. The thick felt platform is a comfortable place to perch or relax. 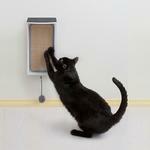 It mounts to walls easily, saves space and gives cats their own space! 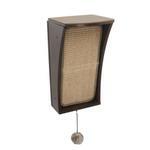 Available in two stylish colors to compliment any home decor.